St Andrews Day falls on the 30th of November, and the day is generally a bank holiday here in Scotland. Across Scotland there are many events and celebrations planned to celebrate St Andrews Day, including special restaurant menus, local music and dance festivals. St Andrews Day is also seen as the beginning of the Scottish Winter Festivals which includes Hogmany and Burns Night, and in Edinburgh and Glasgow there are week long celebrations with ceilidh dancing with live music. To celebrate St Andrews day, we have a great selection of St Andrews inspired flowers and bouquets for decorating your home. Our flowers come with next delivery to ensure they arrive with you before St Andrews day, allowing you to put up some St Andrews decorations ahead of time. 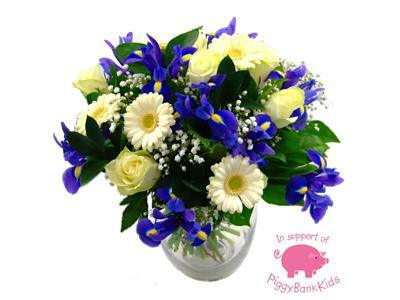 Our Baby Boy Flowers, whilst traditionally sent to new arrivals, this flower has a beautiful arrangement of whites and blues reminiscent of the St. Andrews Flag. A colourful floral bouquet, our Baby Boy flowers contains a mixture of blue iris, white roses and gerberas, and has a beautiful scent to fill your home. This floral bouquet can also be delivered with a handwritten card to include a message when sending as a gift this St Andrews weekend. We have many other flowers and floral bouquets available, including Roses, Gerberas and Lilies which are suitable for your St Andrews day celebrations. Additionally our Winter Flower range provides you with a great selection of flowers for the upcoming Winter months.